Wilo-Stratos MAXO-Z | Wilo Philippines - Your local partner to serve and supply with custom-tailored solutions and products as quicky as possible. Intuitive operation by means of application-guided settings with the Setup Guide plus the combination of a new display and operating button using Green Button Technology. Highest standard of drinking water hygiene and energy efficiency with the new, innovative, intelligent T-const. control function. Optimum hygiene promotion through thermal disinfection detection. 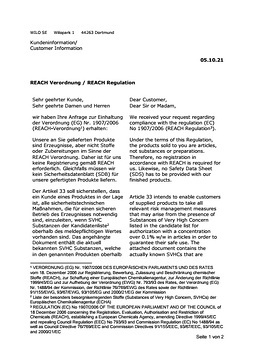 Latest communication interfaces (e.g. Bluetooth) for connection to mobile devices and direct pump networking for multiple pump control via Wilo Net. Maximum convenience in electrical installation thanks to a clearly arranged and spacious terminal room and the optimised Wilo-Connector. Tomorrow’s technology for today’s systems. 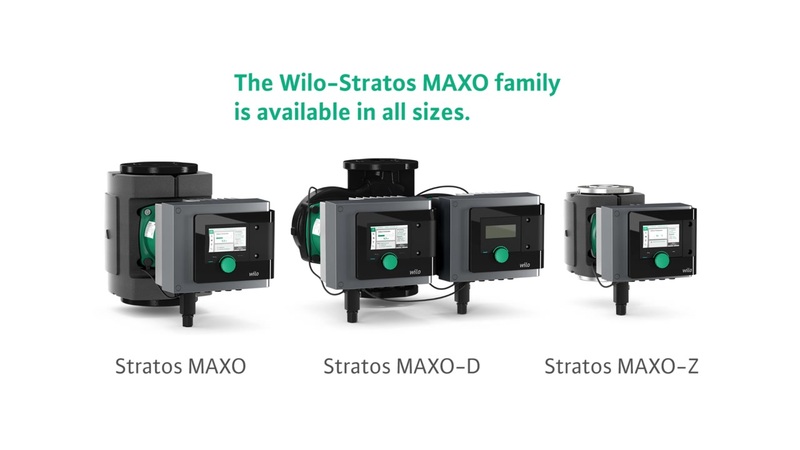 Head start in the future: the Wilo-Stratos MAXO family. The world’s first smart-pump* features tomorrow’s innovations that make your life easier today: The Wilo-Stratos MAXO offers you greater efficiency, connectivity and comfort than ever before. 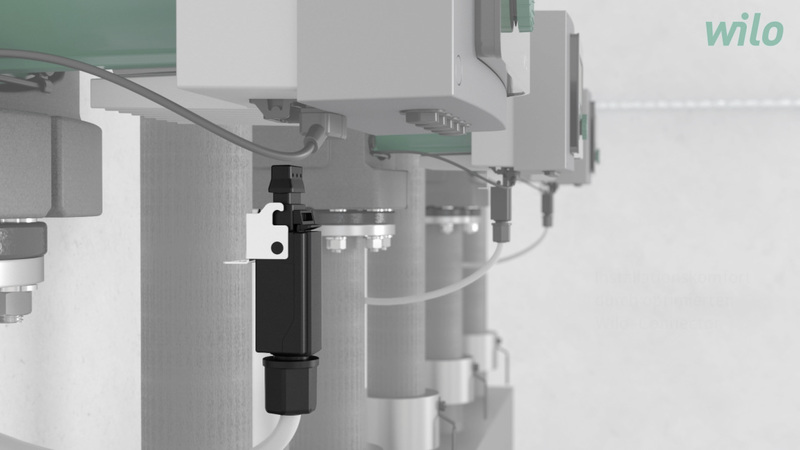 It is the first pump which has an intuitive user interface – and makes installation and operation as easier than ever before. 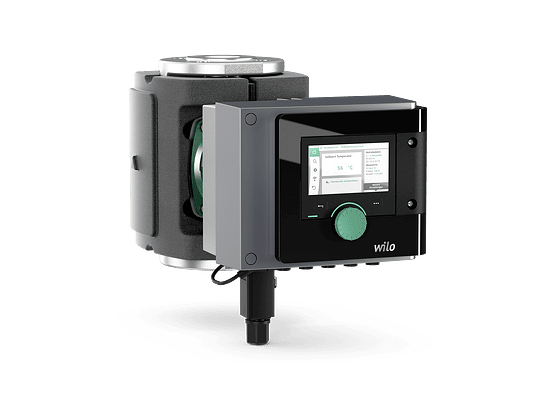 The Wilo-Stratos MAXO also redefines system efficiency: By featuring innovative energy-saving functions and new control modes it attains maximum system efficiency. The highest level of compatibility with existing systems is also a matter of course for our smart-pump. In 2017, the Wilo-Stratos MAXO has already been awarded the “Design Plus powered by ISH” seal of approval for its sustainability, innovative design and energy-efficient technology. In addition, the Wilo-Stratos MAXO has won “GOLD” in the “Technology” category of the “BLUE INNOVATION AWARD 2018” exhibitor’s innovation prize, which was awarded for the first time at the expoEnergy 2018 in Wels. Put your faith in the pump technology of the future; you and your customers will profit from the outstanding features of the Wilo-Stratos MAXO. * We understand a smart-pump as a new category of pumps, which goes far beyond our high-efficiency pumps or pumps with pump intelligence. Only the combination of the latest sensor technology and innovative control functions (e.g. Dynamic Adapt plus and Multi-Flow Adaptation), bidirectional connectivity (e.g. Bluetooth, integrated analogue inputs, binary inputs and outputs, Wilo Net interface), software updates and excellent usability (e.g. thanks to the Setup Guide, the preview principle for predictive navigation and the tried and tested Green Button Technology) make this pump a smart-pump. 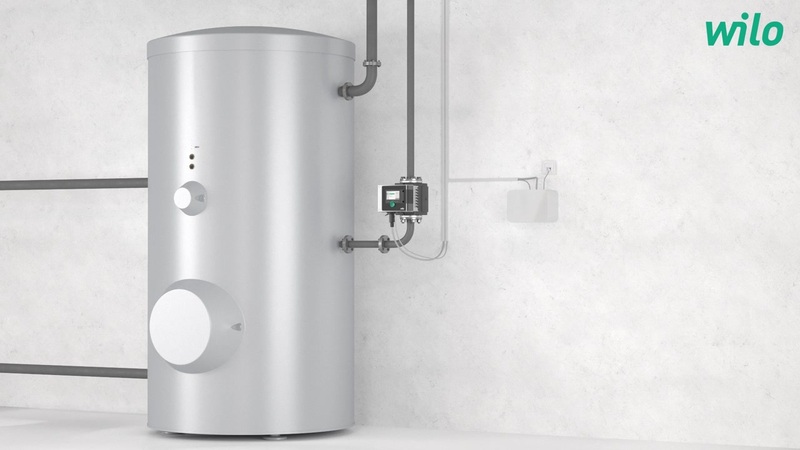 Highest standard of drinking water hygiene and energy efficiency with the new, intelligent T-const. control function. More user-friendliness than ever before: The Wilo-Stratos MAXO-Z offers maximum convenience for installation and configuration – and therefore saving time in your day-to-day work. The control panel, terminal box and power board have been fitted one behind the other to avoid the problem of too small terminal spaces. The power supply unit and the pump electronics are located one level behind the terminal space and are supplied with the same optimised Wilo-Connector for all sizes. Thanks to spring clips for an easy connection, no additional tool is necessary. 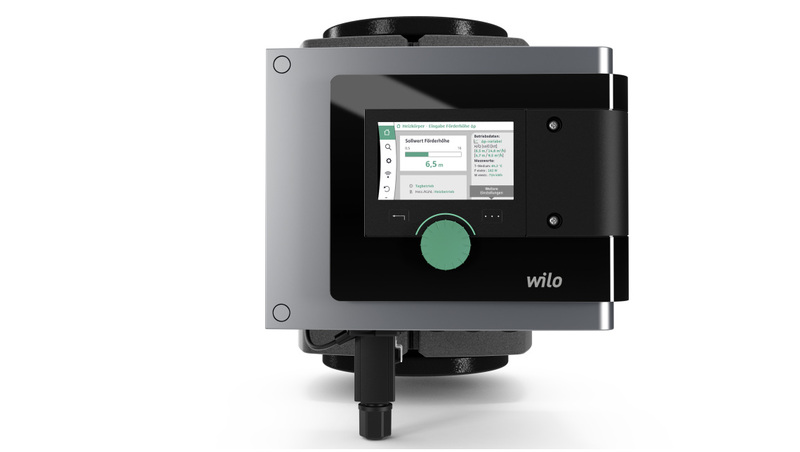 Intuitive operation: Wilo-Stratos MAXO-Z impresses with the application-guided configuration with the help of the settings assistant, a new display and the operating button using the Green Button Technology. This provides outstanding user-friendliness on commissioning. The energy-saving function automatically deactivates the pump at zero-flow-detection. 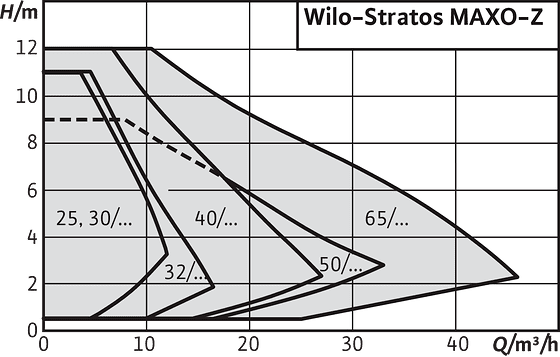 The Wilo-Stratos MAXO-Z recognises when, despite its speed, the volume flow supplied is too low. This means that the valves in the consumer circuit are closed. Thanks to the intelligent function the pump stops the motor if the volume flow falls below a specified minimum level. At regular intervals, it checks whether the minimum volume flow has been exceeded again, then continues in its set control mode in auto control mode. The Wilo-Stratos MAXO-Z thus avoids unnecessary running time and saves electrical pumping energy. 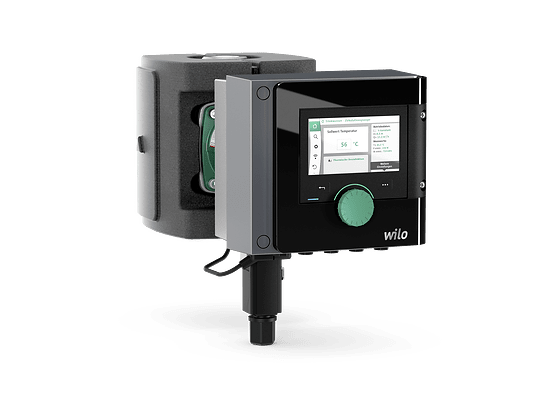 From the integration in building automation to control by app, Wilo ensures comprehensive communication capability with intelligent and smart technologies. We connect you smartly to your pumps and pump systems and give you an overview of installation sites and operating conditions whilst you are on the go. The app can be downloaded from the Apple App Store or Google Play free of charge. The pump facilitates an operation with highest system efficiency via precise setting of the control mode for the system-specific application (e.g. radiator, underfloor heating, ceiling cooling). Bluetooth interface for wireless data exchange and remote operation of the pump using a smartphone or tablet. Serial digital interface Modbus RTU for connecting building automation (BA) via RS485 bus system (possible with Wilo-CIF module Modbus RTU). Serial digital interface BACnet MS/TP for connecting building automation (BA) via RS485 bus system (possible with Wilo-CIF module BACnet MS/TP).